There are numerous ways of typing SMS faster using the mobile device. Some common one is to use the built in hardware QWERT keyboard. However, none of them are suitable for speedy typing like what you can do with the PC keyboard. Another way is to go through the MOSA (Microsoft Outlook SMS Add-in) that we mentioned earlier as the user can utilize Microsoft Outlook and PC keyboard for typing and sending SMS. Besides the hardware assist, there are few softwares that help to speed up the SMS typing. One of them is the newly developed TouchPal Windows Mobile Application Software. 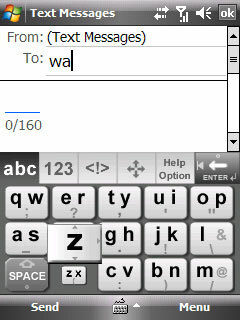 The software, known as CooTek TouchPal version 1.0 is able to speed up the SMS typing through the smart input technology. The software is compatible with any Windows Mobile Pocket PC version 5.0 or 6.0. The user just need to download, install the program and it is ready to go. It can enhance the user’s typing experience whereby he just needs to tap on the screen and slide to the right word for selection. On top of that, the auto-word prediction feature will able to predict uncompleted word intelligently. The file size is quite huge as it requires 2MB of free space in the Pocket PC’s main memory. It is free downloadable here (version for VGA screen 640×480) until December 8th 2007. And amazingly, with the application software assistance, it is believed to be able to achieve maximum typing speed of 300 characters per minutes. So, let’s get a try before you need to pay for it.